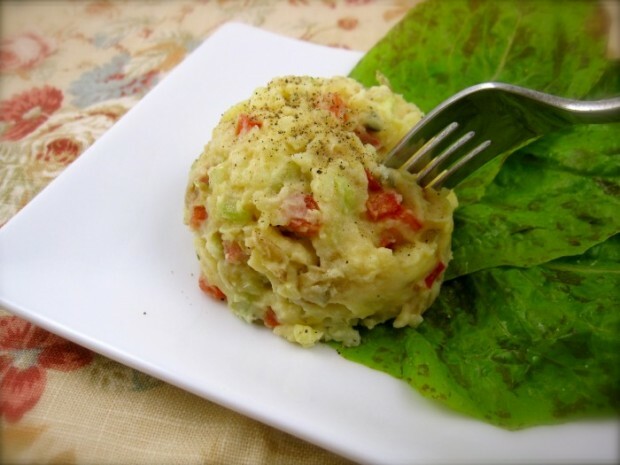 If you grew up in the baby boom era like me, this is the type of potato salad you may remember fondly. (Or not.) In my hometown, this very recipe was served at church picnics next to a platter of fried chicken, and one could always expect a scoop of it snuggled next to the grilled cheese sandwich at the counter bar at Gilchrist Drug Store. My mom made this salad and added a half-cup of finely chopped bacon. It was a tragedy that I forgot to pick some up at the store. Say what you will about this potato salad. But I protect its integrity fiercely, eating it with relish and a sigh of pleasure only memories and ghosts are privy to hear. In a large pot of heavily salted water, cook potatoes until very tender. Drain and toss with butter, if using. Place in bowl and mash.